Chamelaucium is a genus of evergreen shrubs from semi-arid regions of Australia especially the Western Australia. Several species of this genus are however grown as cut flowers in many tropical and subtropical regions of the world. These evergreen shrubs are known for their small and beautiful flowers. 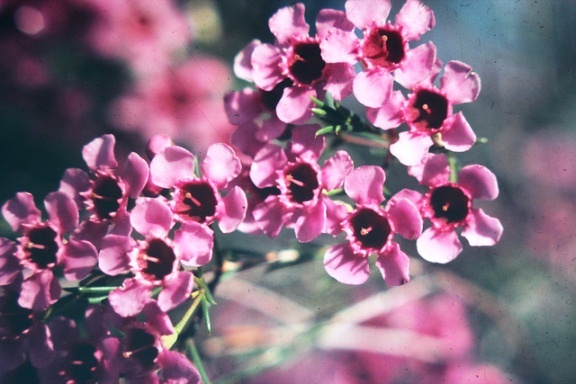 One of the widely known species is Chamelaucium uncinatum or Geraldton Wax Plant. Chamelaucium uncinatum is characterized by needle-like waxy foliage and small white flowers that usually have a touch of pink or lilac. The shrub grows up to 5 meters and serves as an easy to maintain hedge or screen. As it is native to semi-arid climate, Chamelaucium uncinatum prefers a well-drained soil and occasional watering. The best place for Chamelaucium uncinatum is a garden is a bright lit spot where it is protected from over watering and long spells of cold. Besides Chamelaucium uncinatum, many hybrids and cultivars are also sold commercially. Most of these varieties share common characteristics and grow easily from woody stem cuttings.